An unaltered photocopy of your DD-214, WD AGO, NAVPERS, NG or other military issued document clearly displaying your award of the Coast Guard Achievement Medal. 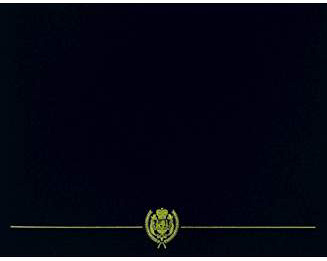 Authorized by the Commandant, U.S. Coast Guard, June 4, 1968. Awarded to any member of the Armed Forces of the United States for service performed on or after April 1, 1967, while serving with U.S. Coast Guard units. Specifically, the award shall be given for professional and/or leadership achievement in a combat or noncombat situation based on sustained performance or specific achievement of a superlative nature. Coast Guard authorizes the letter "V" device. For military personnel whose professional achievements and/or leadership on or after 1 April 1967, are of a clearly superlative nature. Originally the Secretary of the Treasury Commendation for Achievement, when the award was designated the Coast Guard Achievement Medal in 1968, it joined the achievement medals of the other branches of service holding precedence just below the Joint Service Achievement Medal (1983). It is awarded to members of the Coast Guard, including Reserves, as well as to members of other branches serving with Coast Guard Units, for heroism, professional achievement, leadership or superior operational performance. Authorized by the Secretary of the Treasury on January 29, 1964, as the Secretary of the Treasury Commendation for Achievement, this medal was re-designated the Secretary of Transportation Commendation Medal on March 13, 1967. It became the Coast Guard Achievement Medal on June 11, 1968. Awarded to all members of the Coast Guard, including reserves and members of other branches of the Armed Forces, when serving with Coast Guard units, for outstanding leadership, professional achievement and superior performance of duty in either peacetime or combat situations. Establishing Authority: The Coast Guard Achievement Medal was established on January 29, 1964, by Secretary of the Treasury Douglas Dillon as the Coast Guard Commendation For Achievement Ribbon and was redesignated as the Coast Guard Achievement Medal on June 11, 1968. Effective Dates: The Coast Guard Achievement Medal has been in effect since April 1, 1967. Criteria: All members of the Coast Guard, including Reserve personnel, and all members of other branches of the Armed Forces when serving with Coast Guard units are eligible for this award for service performed on or after April 1, 1967. 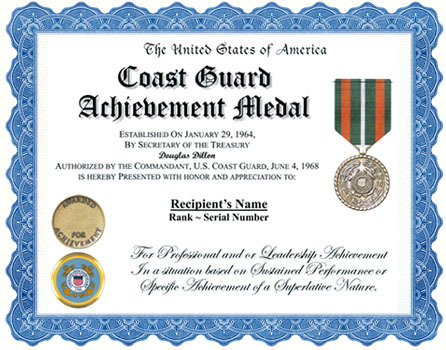 The Coast Guard Achievement Medal is given for professional and/or leadership achievement in a combat or noncombat situation based on sustained performance or specific achievement of a superlative nature of such merit that it warrants more tangible recognition than is possible by the Commandant's Letter of Commendation Ribbon, but which does not warrant a Coast Guard Commendation medal or high award. Professional Achievement: Professional achievement that merits the award of a Coast Guard Achievement Medal must clearly exceed that which is normally required or expected, considering the individual's grade or rate, training and experience and must be an important contribution which is beneficial to the United States and the Coast Guard. Leadership Achievement: Leadership achievement which merits the award of the Coast Guard Achievement Medal must be noteworthy and must be sustained so that it demonstrates a high state of development or, if awarded for a specific achievement, that achievement must be of such merit that it earns singular recognition and it must reflect credibly on the efforts of the individual toward the accomplishment of the unit mission. Order of Precedence: The Coast Guard Achievement Medal is worn after the Joint Service Achievement Medal and before the Coast Guard Commandant's Letter of Commendation Ribbon. Devices: Additional awards are denoted by Gold Stars. The Combat Distinguishing Device may be authorized for service subsequent to June 11, 1968. The Operational Distinguishing Device may be authorized. Designer and Sculptor: The medal was designed by Irving Lyons and sculpted by Lewis J. King, Jr., both of the Army's Institute of Heraldry. First Recipient: The first Coast Guard Achievement Medal was awarded to Commander David M. Kaetzel on February 1, 1969. Obverse: In the center of a bronze medallion one and a quarter inches in diameter, the Coast Guard seal surrounded by a laurel wreath. The laurel wreath is in turn surrounded by a continuous cable. The Coast Guard seal signifies the fact that this is a Coast Guard decoration; the laurel wreath represents achievement, and the continuous cable refers to both naval service and the ideal of perfection. Reverse: At the top of the medal, in two lines, the words AWARDED TO; at the bottom of the medal, also in two lines, the words FOR ACHIEVEMENT. Directly above the word FOR is a raised bar, above which the recipient's name is to be engraved. Ribbon: The ribbon to the Coast Guard Achievement Medal is identical to that of the Navy Achievement Medal except that a white pinstripe has been added to the center of the ribbon.